child care design Archives - 45 Conversations Media & Education Ltd. In the past while I have noted some great articles and posts related to child care design. Good child care design is very important when it comes to the development of high quality early learning and care programs. This post shares some articles that offer some interesting approaches to child care design. “Acton Ostry Architects has designed two buildings to go atop the Gastown parkade located at 150 Water Street, and 151 West Cordova Street. The parkade is divided by Trounce Alley. The spaces will contain 37 full day child care spaces, comprised of 12 spaces for children ages 0 to 3 (toddler) and 25 spaces for children ages 3 to 5 (pre-schooler). “The childcare is a laboratory for self-directed learning within a space flexible enough to respond to the changing nature of education. The Reggio Emilia pedagogy emphasizes three teachers: the educator, the environment, and the children’s broader community. The environment is designed for the experience and scale of the child, and encourages interaction with their environment. Controls and infrastructure for on-site building systems are revealed to encourage questions about operation. Working on a child care project? We offer support, consulting and advisory options related to child care design, development and operations. You can learn more here. 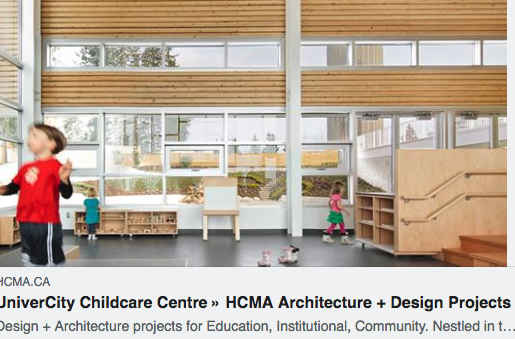 We also offer a professional development workshop that is focused on the design, planning and construction of high quality child care facilities.